The Heartsaver CPR/AED Course is a modular CPR course that teaches rescuers how to recognize and treat life-threatening emergencies, including cardiac arrest and choking for responsive adult, child, and infant victims. Students also learn to recognize the warning signs of heart attack and stroke in adults and breathing difficulties in children. This program teaches rescue breathing with and without the use of barrier devices. This course covers AED and relief of choking in the adult, infant, and child. If you are a healthcare provider you may be required to take a different CPR course (CPR/Basic Life Support for Healthcare Providers). To register for the CPR/BLS course, select that course from the “Offered Classes” link for more information and secure online registration. This AHA Heartsaver Course does NOT include First Aid training. 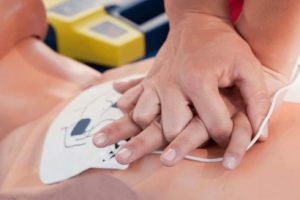 If you are required to take a CPR and AED Course that includes First Aid, select that First Aid, CPR and AED from the “Offered Classes” link for more information and secure online registration. Students must be able to read English sufficiently to understand the skill handbook. They must be in good physical shape to kneel on the floor for training. Students will not be admitted late. Bring some snacks to class. Class size six (6) students. Vasco Career College does not offer refunds once your registration is complete. If you have an emergency that makes you unable to attend the course, you must contact the Career College 48 hours prior to the start time of the class. The Career College Staff will move you to the next available course or issue a course credit. Course credits can only be applied to the same type of course, cannot be used by another person and must be used within 90 days of the missed course. Once a credit is applied, the student must attend that course – a credited course will not be refunded or credited a second time.